3 Big Mouth Strong Bad? Its being started by Piscez, but anyone can help. The format I'm using is high quality jpgs, 250 pixels tall (variable width) and cropped tightly around the character. Individual images for each version of the character, so they can be shuffled around on this page as it grows. Okay, maybe 250 pixels is too large, but lemme get the page all formated and I can change that later. Didn't Strong Bad get changed again slightly at montage? So who's gonna make it? Anyone spot any more changes than the ones I pointed out? Arms are lower, more slanted, and slightly more behind him. Yer right. There's new shading on his legs and on his boots. --Broccoli Kills Word. It's not the 6, although the boots have been redesigned too look like the sixth. You can also see a little shading on the top part of the shoe, making it look slightly more 3D. In Macromedia Flash, objects can be positioned and sized relative to each other. 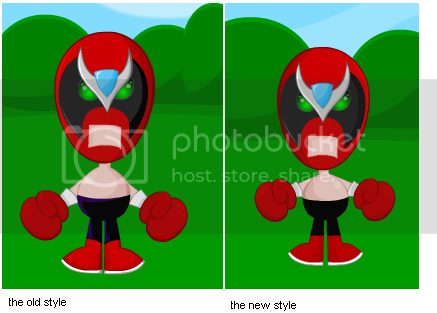 Strong Bad is probably made out of several Flash symbols, some of which have to be repositioned for animation effects. Perhaps TBC were simply not very precise in doing this. That would explain away little details like his head becoming larger, his arms changing position, etc. on the current one, the 2 shiny spots on his body switch to the left side. It's also in Xeriuxly Forxe!!!!!!!!!!! We must add this at wunse!!!!!!!!!!!!!!!!!!!!!! This page was last modified on 21 March 2017, at 13:28.